Welcome back to another week of Fantasy basketball. We’re now into November, still super early in the season, so plenty of time to scoop gems off the wire. This week, Magic Johnson came down on Coach Luke Walton in the wake of a slow start by the Lakers; things went from bad to worse for the Cavs with the loss of Kevin Love (toe surgery) for at least six weeks; and even off the court Cleveland is facing issues as former assistant coach Jim Boylan has filed a lawsuit against the club. 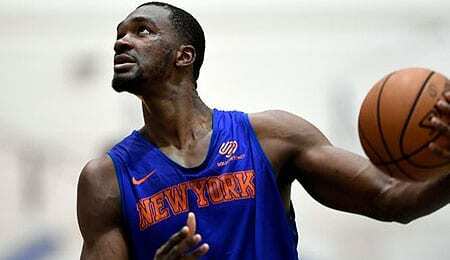 Noah Vonleh, PF, New York Knicks (ESPN: 4.0 per cent; CBS: 32 per cent): Okay, Friday was a bit of a stinker as he was limited to 10 minutes because of foul trouble, but Vonleh has really been emerging for the Knicks this season. He’s seeing more PT than ever, and is showing potential as a consistent double-double threat. Vonleh will need to be a bit smarter on both ends of the court, so there’s definitely room for improvement, but it feels like we’re witnessing the early part of his breakout. At the very least, he’s worth employing while he’s starting with David Knox (ankle) out of the lineup. Coming into the NBA, Vonleh was lauded for his size and potential. We’re starting to see that come to fruition now, and man, he can make opponents look sick at times (see video below). Cameron Payne, PG, Chicago Bulls (ESPN: 0.7 per cent; CBS: 30 per cent): Payne is another player trying to carve out his niche while injuries have opened the door. With Kris Dunn (knee) out, Payne is finally showing us why he was taken 14th overall in 2015. A week and a half ago, Payne went off for 21 points in 31 minutes, and while he’s been inconsistent since then, he’s had a pair of 15-point games, and on Friday dropped eight dimes. He’s doing a way better job from beyond the arc this season, and as long as Dunn is out, he makes for an inexpensive and viable DFS option, with the opportunity to open up a bigger role in the rotation long-term. Juan Hernangomez, SF/PF, Denver Nuggets (ESPN: 0.1 per cent; CBS: 2 per cent): Need a big that can contribute some points and plenty of treys? Hernangomez could be your man. On Thursday, he went off for 23 points in 29 minutes, nailing five treys with four boards, two blocks and a steal. Hernangomez’s shooting from downtown is so vastly improved this season that he’s worth considering. He’s become more valuable each season since going 15th overall in 2016, and if he starts regularly getting 20 MPG or more, he’s ready to break out. Mitchell Robinson, C, New York Knicks (ESPN: 0.3 per cent; CBS: 30 per cent): Robinson was the Knicks’ second round pick this year, but they may have found themselves a diamond in the rough here. On Friday, he managed a double-double in 34 minutes with three assists, three steals and a block despite foul trouble, and on Monday, he poured in 11 points in just 15 minutes. The rookie is starting to see more PT, so you better jump on him now as he’s earning the team’s trust. A 7’1″ centre out of Western Kentucky, Robinson’s game is really trending in the right direction, and we think he could be a major source of double-doubles if he keeps getting more PT. Clippers’ two-guard Lou Williams is heating up lately, pouring in 28 points in just 21 minutes Friday after scoring 26 in 24 minutes on Thursday. His touches are actually down a smidge lately, but considering how accurate he’s been lately, he should get more shots going forward. The Raptors continued their best start ever despite the fact that Kawhi Leonard was meh on Friday with just 19 points. He did pitch in with five assists, two steals and a block, and has done a really great job of limiting turnovers lately. Just note that for now, he will continue to sit one game of back-to-backs. After a couple of somewhat quiet offensive games, Orlando centre Nikola Vucevic put up 22 points on Friday, adding 11 boards, three blocks and a trey. His three-point shooting has cooled a bit lately after a ridiculously good start, but he’s still draining 57.1 per cent of his shots from downtown. Phoenix centre Deandre Ayton continues to show why he went first overall in the draft this year, going off for 17 points (7-of-10 from the field) and 18 boards with two blocks on Friday. The kid’s free throw shooting has left something to be desired lately, but man, can he ever ball. Chris Paul took matters into his own hands for the struggling Rockets Friday, putting up 32 points (13-for-27 from the field, 5-for-12 from downtown), 11 assists, seven boards, two blocks and two steals to lead the team a much-needed victory. What a monster game from CP3, who is seeing bigger minutes lately, and seems more driven since returning from his two-game suspension. After missing most of last season, it’s taken Memphis PG Mike Conley some time to shake off the rust, but he’s clearly back now. He hit 7-of-18 from the field, including 3-of-6 from downtown, on Friday as part of a 28-point performance with five boards. Conley’s shooting is coming around lately and he’s doing better work on the glass than he ever has — especially on the offensive boards. Athletes are supposed to be competitive and win no matter what. You may think this trait would come in handy in real life too — and quite often it does. Allen has been providing some serious “juice” in Memphis recently (take in what we did there), with his most notable performance being a double-double (10 points, 15 rebounds, two steals and a block) against the Celtics Sunday. It’s not clear how long he’ll posing in front of the Grizzlies’ injured backcourt, but based on his recent production; he’s worth taking advantage of – especially for those steals (14 over the five game stretch). Go drink some Allen’s juice now. For a player that has played on eight teams in just four seasons, Smith might have finally found a home in Philadelphia. As a starter for the 76ers, he’s averaging 15 points and seven assists while shooting 47 per cent from downtown. Smith isn’t a flashy pick up, but could be an under the radar pick to help you win your league.